Patients involved in major trauma frequently suffer from severe blood loss and anemia, which can be challenging to treat. 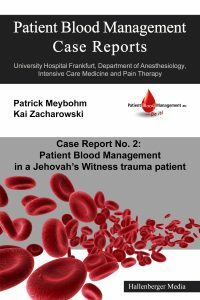 Additional issues are presented in the population of Jehovah’s Witness patients, who refuse transfusions of allogenic blood or its components. We established a stable hemodynamic status in a young Jehovah’s Witness patient with major trauma by applying principles of patient blood management. Patient Blood Management (PBM) is a multidisciplinary, evidence-based approach to improve perioperative patient care. The concept includes preoperative screening, diagnosis and treatment of anemia and hemostasis, adequate blood product utilization and blood-sparing techniques. The use of a PBM concept will be of benefit for patients, society, doctors and hospitals. The case reports in this series will provide a case-based deeper understanding of the concept.